If you ask me, "Where have you been?!?" I'm afraid I don't have a good answer for you. Can I just say I have been out of it temporarily? At this point, I am so far behind, I am going to post updates in pieces, otherwise it would never get done. 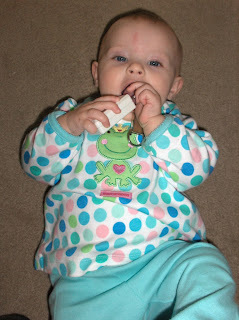 The most interesting tidbit, is that Avery has been crawling since Feb 13th! Pretty much 7.5 months old. This video was taken early on (2/21). She is quite quick and professional looking now. At this point, she is pulling up on everything. 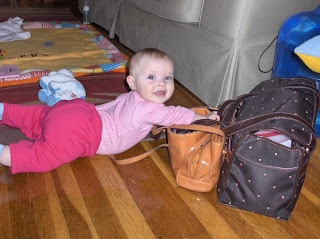 The scariest part of the crawling is that she gets into everything now. 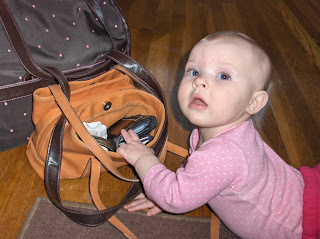 To be fair though, she did drop her toy into the purse before I caught her digging in the purse to retrieve the toy. I loved the "Caught with the hand in the cookie jar" moment. 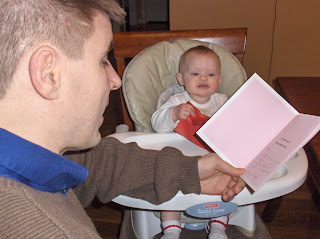 On Valentines Day, Avery discovered her favorite Valentine, herself! 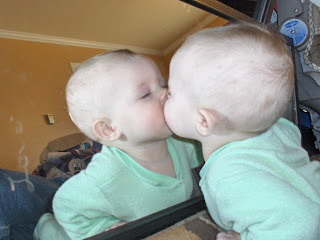 If only we all felt this way about the reflection in the mirror. When I say she is getting everywhere, I do mean everywhere. 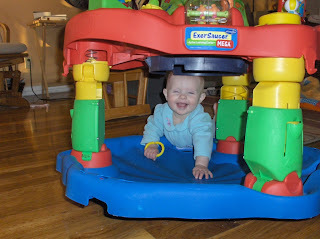 This was great fun for awhile, crawling under the exersaucer, getting stuck and hollering for mom. 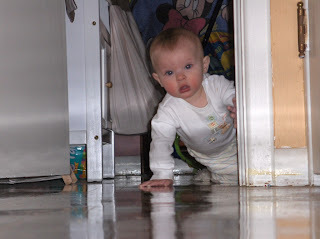 She also realizes now that she can follow us around the house. This is her realizing she is alone in her room and coming to find us. This was the best photo I got for her 8 month old shot. As I said earlier, I have been out of it. Last, this is a set of letters that my Aunt and Uncle in Austin sent to Avery for Christmas. When we opened the gift, it was 5 white letters with paint and paintbrushes. I finally got around to decorating them, and I think they turned out wonderfully. The next challenge is to get them up on the wall. Thanks Mike and Debbie! That's all for now. We also took a trip to Tucson which will be another post, but my mom posted some great shots of that trip here on her blog. Adorable pictures! Love the Spring look and that you've got a shelf, too!